Unquestionably the most fun Shakespeare has been on-screen in a long time. Twelfth Night, always considered world-wide to be one of the most fun-filled of the Bard's plays, is given an enchanting presentation with a superb cast under the masterful direction of Trevor Nunn. For those unfamiliar with this fantastic tale, it runs like this: A shipwreck off the coast of Illyria causes the separation of twins, Viola (Imogen Stubbs) and Sebastian (Stephen Macintosh) who now each believe the other to have drowned in the violent storm. 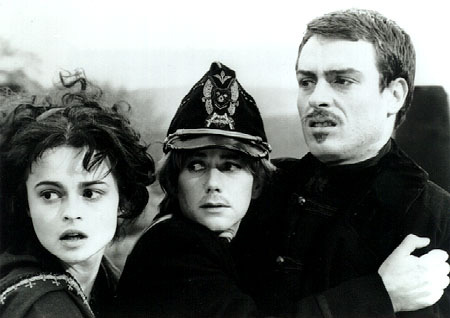 Once on shore, Viola disguises herself as a boy named Cesario and finds employ with Orsino, the Duke of Illyria (Toby Stephens). A local noblewoman named Olivia (Helena Bonham Carter), having recently lost her father and brother has decided to enter into a seven-year period of mourning, repeatedly rejects the advances of the lovesick Duke. Cesario becomes go-between in this unrequited affair while simultaneously becoming more intimately attached to each of the parties in separate ways. Sebastian also eventually appears on the scene and, complicating matters even further, is constantly mistaken for Cesario. A film about romance with romance in the background and irony abounding in the air. The confusion of genders and the greater confusions of love confront the viewer continuously with a forceful awareness of the complications attached to romantic involvements. The background is filled with some of Shakespeare's most enjoyable characters (such as Sir Toby Belch, Malvolio, Sir Andrew Aguecheek, and Feste) delightfully portrayed by actors such as Mel Smith, Nigel Hawthorne, Richard E. Grant, and Ben Kingsley. Director Nunn has a reputation to live up to and he certainly does it proud in this gem of a film. He gives the comic situations a contemporary ring without glossing over or losing sight of the painful edges often accompanying love such as that most excruciating humiliation experienced by Malvolio. Filmed on National Trust properties in Cornwall the locations help to capture the Celtic magic of this version of the tale which is dressed in the styles of the 1890's. From the underwater magic of the original separation to the moving reunion of the twins, it is a pleasure to behold. The similarity between Stubbs and Macintosh, who at first do not appear to share any great likeness of feature, becomes striking and astounding. It is easy to believe the tale when one is swallowed into it so completely. Superb points for everyone involved. Even those who complain they dislike watching Shakespeare are bound to smile and laugh at this wonderful performance.